A keyboard and stylus. Whoa, Apple. But its real advances give us more to think about as we look ahead to the Surface Pro 4. After launching a larger iPhone 5 Plus last year that mimicked phablets like the Lumia 1520, Apple has taken another page from Microsoft’s playbook with the Apple iPad Pro—which now includes a Surface-like keyboard and stylus. 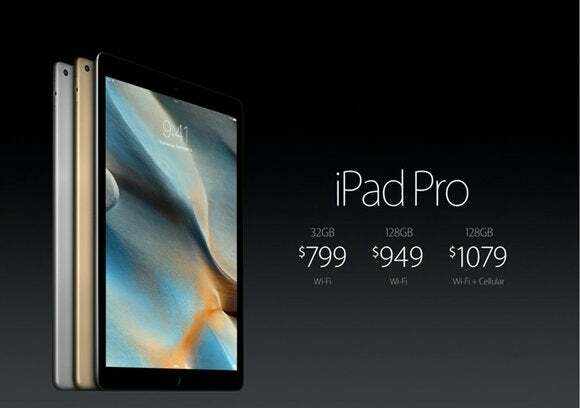 Apple’s new iPad Pro—available from $799 to $1079, with storage ranging from 32GB to 128GB—will be available this November, a bit after the reported introduction of the Surface Pro 4. But for right now, the comparisons between it and the Surface Pro 3 are undeniable. Before we dive into the hardware specs, let's make one key software difference clear: The iPad Pro still runs iOS, instead of the full Windows desktop OS you can use on a Surface Pro. For many power users, that's the difference between an accessory and an essential piece of equipment. Doesn’t this Apple Smart Keyboard look familiar? Because the iPad still lacks a kickstand, the Smart Keyboard copies the foldover “origami” keyboard of Amazon’s tablets. Like the Surface, it connects to the tablet through three metal bumps, which transmit data as well as power. Unlike Microsoft’s Type Cover, the keyboard lies flat on the tabletop; and, like the Touch Cover, it’s made of fabric as well—an improvement over typing directly on glass, but probably not much. 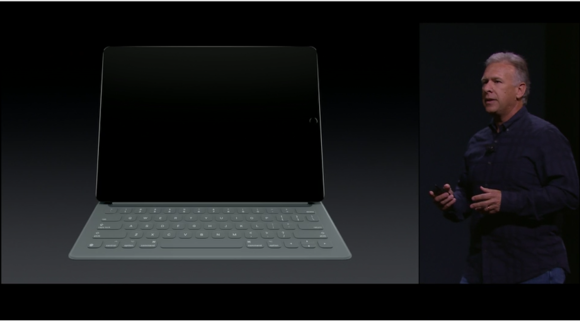 The keyboard will be available for $169, in November. The Apple Pencil in action. And then there’s the Apple Pencil, a $99 stylus that’s really long—about the length of an ordinary #2 pencil, it appears. It’s far longer than the stylus that ships with the Surface Pro 3 tablets, and it appears to lack a loop or even a docking port to connect to the tablet. It does, however, include a Lightning connector for charging. 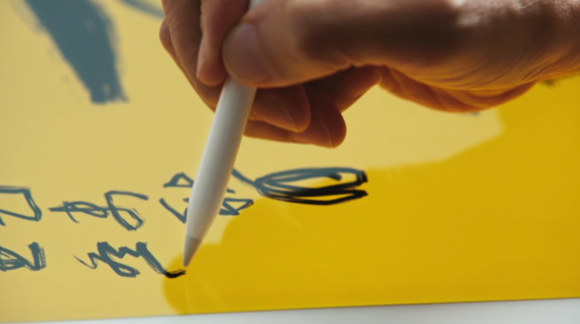 Apple’s Schiller claimed that the iPad Pro and the new Pencil worked together to give the impression of nearly latency-free inking, supporting different levels of inking pressure. It has the precision to “touch a single pixel,” Schiller claimed. Oh boy, multitasking! But not quite in...windows. 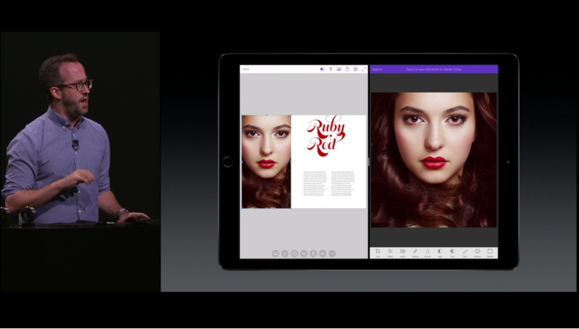 To support his claims, Schiller brought on stage executives from Microsoft—to show off Office for the iPad—and Adobe, which demonstrated apps like Adobe Fix, allowing graphic artists to manipulate images digitally on the iPad. In other ways, the iPad Pro jumps ahead of the Surface Pro 3. For starters it's slightly larger, at 12.9 inches versus 12 inches. Apple hasn’t said how much memory is inside it, but Apple senior vice president of product marketing Phil Schiller said that the tablet includes a more powerful 64-bit A9X chip that’s faster than 80 percent of the PCs shipped in the last 12 months, and 90 percent more powerful, graphically. The display boasts a higher resolution than the Surface Pro 3 as well: 2732x2048 pixels versus the 2160x1440 display offered by the Surface Pro 3. The battery life is a tad higher: 10 hours, versus 9 hours for the Surface Pro 3. Apple even showed off multitasking, dividing the screen between two different windows that could run different tasks. 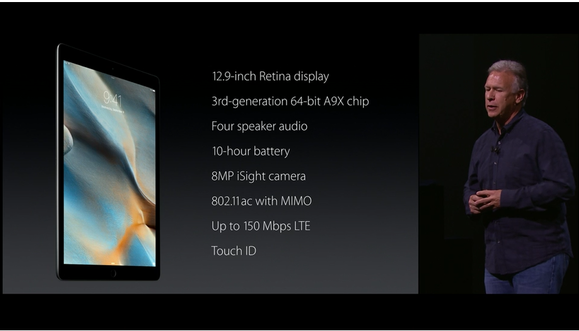 For now, the iPad Pro's hardware specs are arguably a tad superior to the Surface Pro 3's. But while Apple may claim to have “reinvented” the idea of a productivity tablet with the iPad Pro, Surface owners know where Apple found its biggest ideas. We expect Microsoft to one-up Apple yet again with the Surface Pro 4.